When the first image from Stan & Ollie dropped a few weeks ago, it was tough to tell the difference between John C. Reilly and Steve Coogan from the legendary comedy duo. But a single still image means nothing if the performances don't measure up to the subject matter. Based on the response out of TIFF, Sony Pictures Classics' enthusiastic acquisition of the film, and now this debut trailer I don't think that's something we have to worry about. The first trailer for Stan & Ollie promises a slightly unexpected look at comic pair Stan Laurel and Oliver Hardy. Rather than focusing on the heyday of their decades-spanning comedy career, it follows them as they embark on one final tour of Britain with their best days long behind. While there are glimpses of the slapstick Laurel & Hardy were famous for, this actually looks like quite the sobering biopic. Here's hoping director Jon S. Baird (Filth) and Philomena writer Jeff Pope find a good balance. 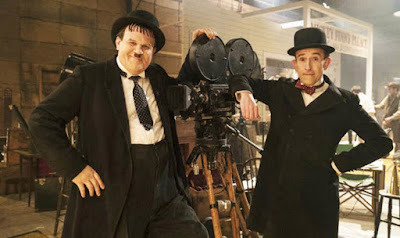 Also starring Shirley Henderson, Nina Arianda, and Danny Huston, Stan & Ollie opens in January across the pond but has yet to get a U.S. date.